Two queens await the throne! 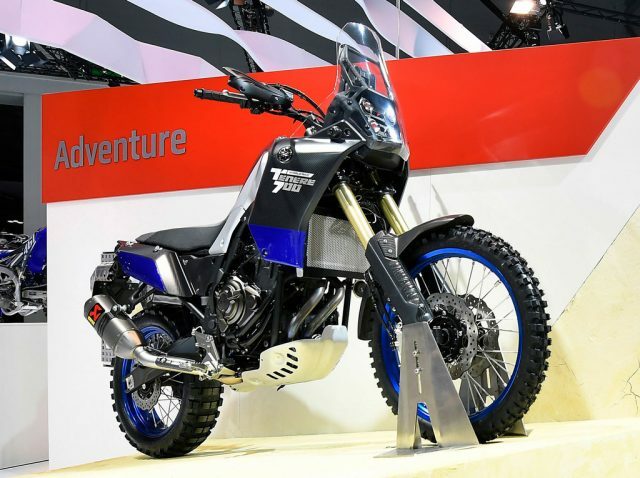 For many years, the Adventure sector of the market has been divided into two significant worlds: on one hand, machines with lightweight single-cylinder engines, such as the KTM 690R or the Yamaha XT 660Z Ténéré, on the other hand, there are “big” bikes such as the BMW R1200 GS, the KTM 1990 and 1290 and the Triumph Explorer 1200. Two years ago, the Honda CRF1000L Africa Twin was added to the list of “big” bikes. Yet, somehow, motorcycle enthusiasts were continually forced into making a radical decision, to choose either a single-cylinder, which is light and agile off-road, but falls short when it comes to long trips on asphalt, or a large two-cylinder, with huge engine power and comfort for the motorway, but awkward and difficult to handle off-road. The only choices available in the “middle ground” were the BMW F800GS and the three-cylinder Triumph Tiger 800. Beautiful, but expensive, and not exactly light and easy to manoeuvre. Things began to change when initial rumours began to spread about the imminent launch of a twin cylinder KTM with mid-level engine capacity, followed almost immediately by the news of the upcoming arrival of the new Yamaha Ténéré, another twin cylinder with mid-level engine capacity. Then suddenly, after countless sightings and several photoshopped drawings on social media, the two prototypes finally appeared during EICMA 2017, the prestigious annual motorcycle show held in Milan. Almost immediately, the two prototypes were hot gossip, creating a frenzy amongst enthusiasts who have a passion for adventures on two-wheels. When will KTM and YAMAHA make theses motorcycles part of their standard production? Motorcycle enthusiasts worldwide were hoping to be able to try them at dealers within a few months, and signs from the industry press were being monitored constantly. Enthusiasm and anticipation was certainly clear. Driven by the powerful LC8c twin cylinder engine also used in the new 790 Duke, a “new born” model designed for lean on/off use. 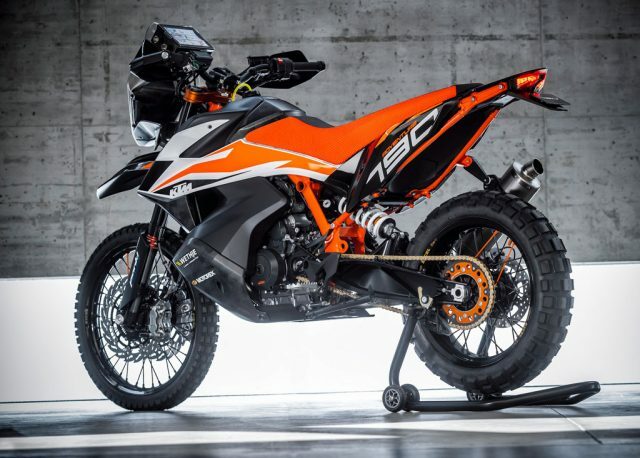 According to KTM, the image created is that of a light and compact mid-range travel Enduro, with a developed cross-country capacity. The prototype of the KTM 790 ADVENTURE R fully embraces a “rally” philosophy and this is evident by its overall features: a high dashboard and low-slung tank, the shape of the seat and its sturdy steel-tube support, spoked wheels – 21″ front and 18″ rear – studded tyres and the entirely adjustable, “long” WP suspension. During its test phase, a lucky few were able to take a peek at the bike, including the monthly magazine, IN SELLA, which has speculated on the possibility that the KTM will be officially launched earlier than planned at Mattinghofen this summer. This model can be positioned between the 690 and the larger twin cylinder Adventure motorcycles. In the world of Adventure motorcycles, a special spirit lingers around motorcycles that have names linked to the desert. The new mid-weight Ténéré will soon become part of this great family of motorcycles. Admired as a prototype at EICMA and currently the star of the incredible World Raid Tour, along with the older XT120ZE Super Ténéré Raid Edition (the famous Maxi-Enduro version kitted-out for explorations of “unlimited mileage”). One thing to remember is that Yamaha actually began its special relationship with the adventure world in the 1970’s, developing models based on motorcycles that won the legendary Paris-Dakar, such as the XT600Z Ténéré, on which many motorcycle enthusiasts have explored the world. Later on came the XTZ750 Super Ténéré and XTZ 660 Ténéré models, universally used by long distance riders because of their performance, durability, and reliability. This spirit is now reborn with the “700”, introduced a year ago as the “concept T7”, then subsequently presented at EICMA. Those who were able to test it were impressed by its torque and its agility, the result of a light compact frame. The video that shows the motorcycle in action (click on the link at the end of the text) speaks for itself. The prototype seen at EICMA closely defines the specifications of the production model that we should soon be able to find on the market. Its compact 689cc CP2 engine, based on the engine that drives the MT-07, delivers manageable and easy-to-control power in a wide range. An ideal condition for both “on” and “off road” riding. The prototype also adopts a dedicated rally-style Akrapovič exhaust, which reinforces its off-road look, while emitting a deep, powerful sound. In order to achieve an improved ride, the steel frame has been redesigned and improved in key areas. The chassis incorporates an essential inverted fork and a rear shock absorber, providing excellent performance in all conditions. The fuel tank has been developed to provide substantial autonomy between refueling while, at the same time, offering excellent ergonomics that contribute to reducing its weight. The side panels, front fender, and one-piece tail are carbon fiber, while the cowl is equipped with a Dakar Rally-inspired four projector headlight assembly. The dashboard is designed to allow the rider to mount additional GPS equipment. Inspired by the high level of interest generated in recent months, Yamaha will be taking the Ténéré 700 World Raid prototype on a challenging around-the-world trip that will last for most of 2018. SATELLITE CALLS... WITH YOUR SMARTPHONE!